A ham-handed contemporary Phantom of the Opera that features a teen pop sensation and an agoraphobic boy by the adult author of The Wolfen (1978). 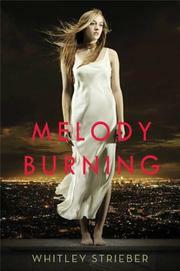 Teen singer and actress Melody McGrath wakes one night to find an attractive boy beside her bed. His name is Beresford, and he’s been living in the walls of her L.A. high rise since the day his father was murdered for trying to document the building’s violations. Instead of being understandably terrified, Melody is charmed, and the two fall in love immediately. They are torn apart when the building super discovers Beresford, and he is shipped off to foster care. Luckily, just before he is taken away, Beresford sees the basement bomb planted by the shady superintendent and his father’s murderer in order to collect a hefty insurance check. So he breaks out of juvie and arrives just in time to save Melody from the burning building by crawling down the side, Spider-Man style. Stronger writing may have distracted readers from the plot’s sheer implausibility, but insipid lines such as, “ ‘Melody,’ he said in his heart, ‘if I die tonight, my last thought will be of you,’ ” and overuse of the words “beautiful” and “perfect” to describe everything from Melody’s eyes to Beresford’s muscles do little to help its case.